The National Focal Point has to organize at national level a 2-day workshop, where the collated information (national key stakeholders interviews and desk-exercise) will be reviewed and synthesized and prioritized by the national key stakeholders, under NFP guidance. 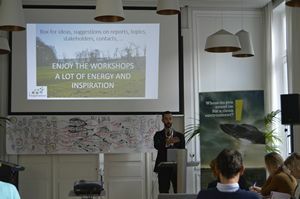 On 29th and 30th of October, OVAM invited more than 30 soil and land use experts to the Belgian INSPIRATION workshop. We were happy to be able to welcome some special guests from Luxembourg and Denmark. The inspirational setting of the Muntpunt in Brussels stimulated cross-disciplinary thinking and debate. During a World Café Tour, participants became acquainted with each other and debated how to link big societal challenges (such as climate mitigation, healthy living, …) with aspects of soil and land use (such as agricultural practices, contamination,…). The fundamental role of soil and land use and the intertwining of all different aspects were stressed. This intertwining also appeared in the next sessions where we tried to link urgent research questions with the different challenges related to soil and land use. What kind of knowledge and tools are needed to tackle societal challenges? 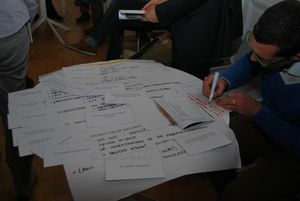 How can we bring together all fragmented knowledge and stakeholders into a bigger synchronized systemic framework? How can we develop the necessary mind shift and change in behavior? Both knowledge producers and knowledge users discussed, in a critical fashion, the role of scientific research and the interface between science and policy. Inspiring cases were shared and possibilities for trans-disciplinary and cross-boundary collaboration and funding were explored. The OVAM looks back in satisfaction on these 2 days filled with inspiring encounters and the collection of a substantial amount of data and information.